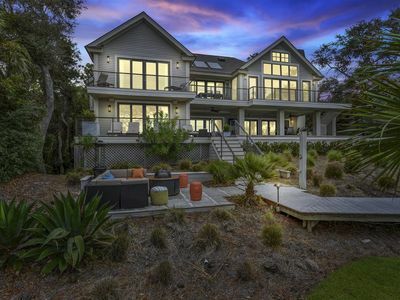 Breathtaking ocean views from almost every room in the house, grand architectural interiors with impeccable lighting, and luxurious furnishings, welcome to 27 Duck Hawk; your quintessential getaway! 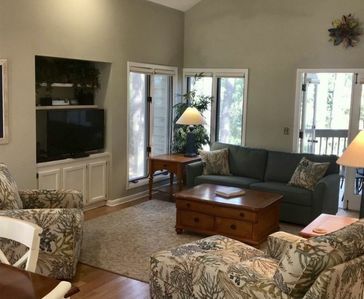 Recently updated (2014-2015), this home has every comfort for your next summer vacation, fall retreat, winter escape, and spring getaways. With enough room to sleep 14 comfortable, there is room for everyone to gather while maintaining their private spaces. 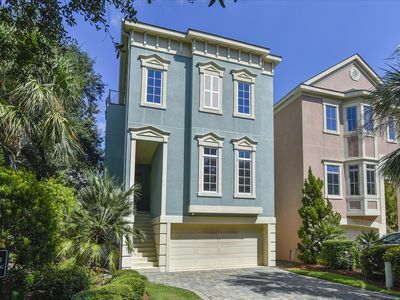 Enter through the parking garage and just about 8-10 steps lead directly into the warm foyer. 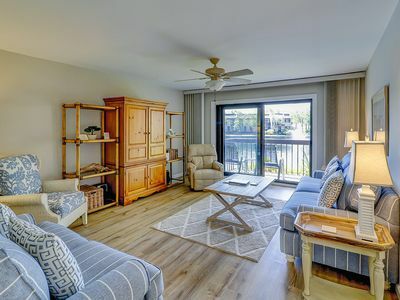 The cozy living area with ceiling to floor windows offers extraordinary ocean views, batten board decorative walls and offer a built-in banquette with enough seating for 6 comfortable. 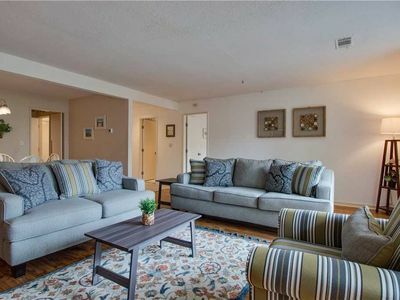 Additional seating is available just pass the wet bar and beverage center, and into the rustic family room, home to a cross sectional sofa with matching ottoman, a sleek chair, and a mounted flat screen TV sitting above the mosaic tile mantle. 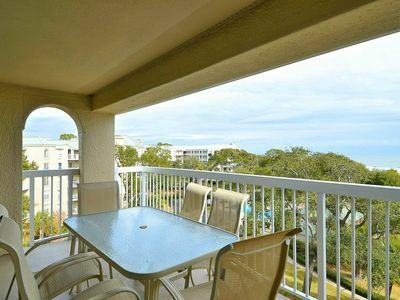 Sliding glass doors lead out to the deck which has plenty to offer. 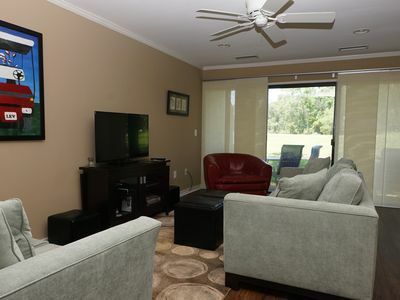 Located here are, a built-in grill, a pool and hot tub, a mounted flat screen, a table for you to deal a hand of cards or play board games, a seating area with four comfy wicker armchairs, where you can entertain guests before dinner while watching your favorite game on the mounted TV, and a sun deck with 5 loungers; catch a lot of sun here while cuddling a book and listening to the ocean roar. Steps lead further into the backyard, which has lots to keep everyone occupied. There is enough yard room for a game of dodgeball; a sand volleyball/ badminton court for friendly competition; a hammock to lay in and enjoy the cool evening breeze after a long day at the beach; a fire pit where everyone can gather for storytelling, and the boardwalk that leads out to the beach, everyone’s favorite place to build sandcastles, catch sunrises, and go surfing. 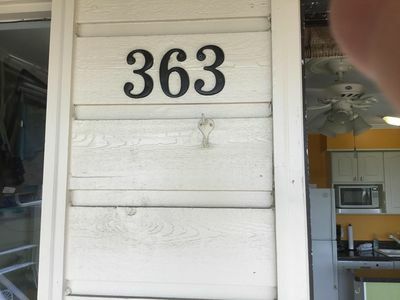 Three bedrooms are located on the entry level all with plush carpet: there is a room for the avid reader, another room with ocean views for the dreamer, and a game room for the young adults, kids, and those young at heart. 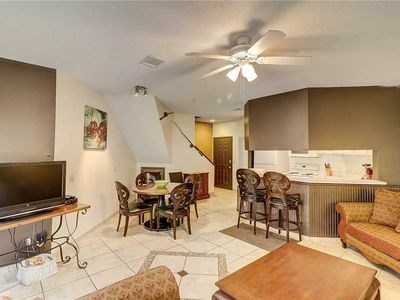 Each bedroom has its own bathroom, the two masters (the room for the dreamer and reader) both have mounted flat screen TV’s, chase lounges, and bathrooms with a tub as well as a shower. The room for young adults features two set of bunks with trundles on the bottom, a table for a game of X’s and O’s, a snug armchair, a door to a private balcony, and other games to keep the kids occupied during the day. The bathroom for this bedroom, crafted in blues and greens, has a walk-in shower and it also serves as the powder room for guests. A bamboo- based rug leads the way to the uppermost level of the home, which boasts even more vibrant views of the ocean and is home to the kitchen, dining room, a dry bar, multiple seating areas, outdoor dining and balcony. 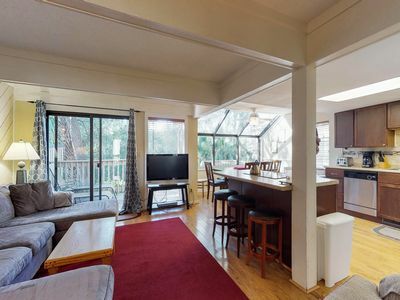 The kitchen is every chef’s dream posing plenteous countertop space, stainless steel appliances, a backsplash behind the range, custom cabinetry and one of a kind ocean views; those will surely influence a lot of cookie baking and traditional family meals. 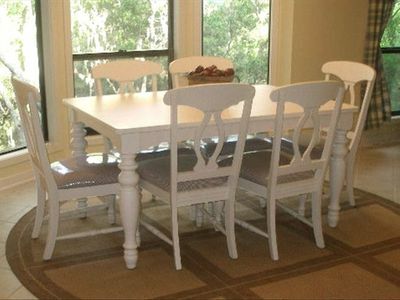 The formal dining room features 8 wicker chairs with snug cushions and a stern wooden table. If you prefer, you can also dine al fresco on the ipe Brazilian hardwood balcony which also offers a table with seating for 8. 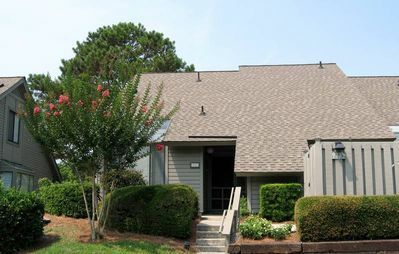 For added convenience and your laundry needs, there is a washer and dryer and a sink on the entry level. There is also an extra refrigerator in the mud room. The sun is out, the sand is warm and the surf is up! 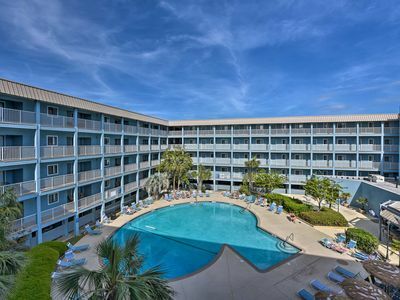 Your vacation at this beauty awaits. Happy Vacationing! Walk to the Beach. Great Lagoon View. Streaming Netflix. Not Your Ordinary Rental. Book Your Vacation Now! 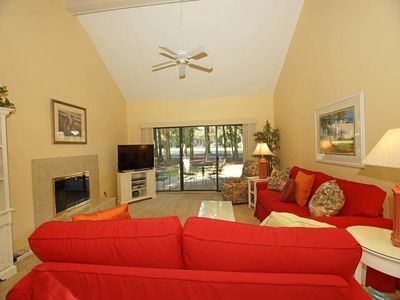 Conveniently located in Palmetto Dunes on the Robert Trent Jones Golf course in Hilton Head Island! 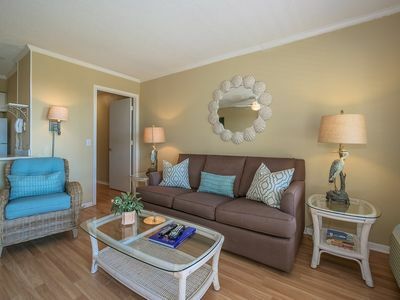 "Maison Bleue": Near Ocean, 3 Master Suites, Seasonal Beach Shuttle! 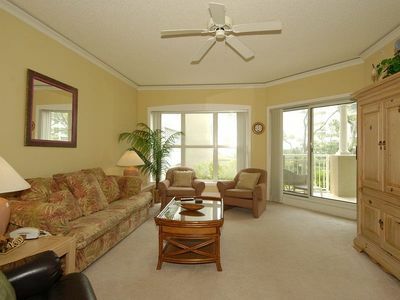 1 bedroom, 2 bath villa in the Hampton Place complex of Palmetto Dunes with ocean views! 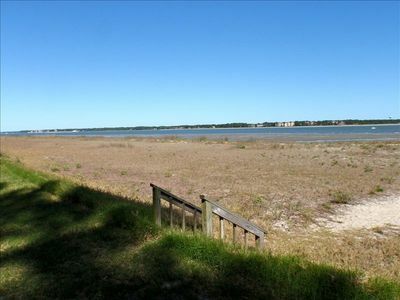 Comfortable villa w/ shared pool, hot tub, lagoon view & beach access nearby! 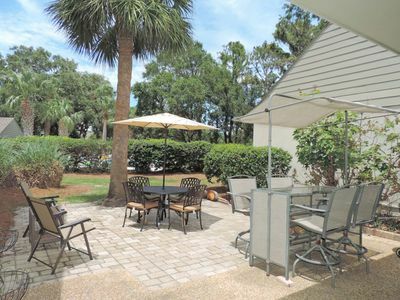 Sunny, dog-friendly villa w/ balcony, shared pool & nearby beach access! 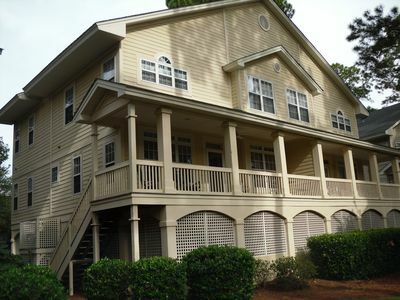 Hilton Head Resort Condo w/ Pools, Beach Access!